Microsoft has launched its Xbox Video website, but the service is missing an important feature. 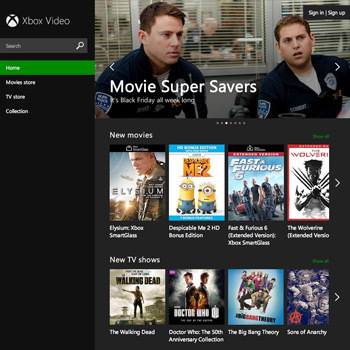 Today, Microsoft unveiled a swanky, new website for the Xbox Video service that launched alongside the Xbox One. The website, video.xbox.com, allows PC and Mac users to stream movies and television shows via their favorite web browser. Don't confuse Xbox Video with Netflix, though. Microsoft's streaming service isn't subscription based, which means that each video has its very own rental fee. Movies like Red 2 and World War Z will drain $4-$5 from your bank account, while television shows like Doctor Who and American Horror Story typically cost $2 per episode. Strangely, the Xbox Video website does not currently support HD streaming, an option that is available on the Xbox One and the proprietary Windows 8.1 application. The website reportedly has over 300,000 videos to choose from, and many of those are new releases, which means that Xbox Video could become a very real competitor in the streaming video industry. Netflix has always attempted to keep its licensing costs down by avoiding newly released videos, and with Blockbuster recently shuttering its windows, people have limited options when it comes to new releases. Plus, with Steven Spielberg producing a Halo series that will be exclusive to the Xbox One, things might start to get interesting.